Let’s get one thing out of the way – Honda makes great cars. There’s absolutely no doubt about that. But of course, it’s not so difficult to make good cars, even great ones, which start at double-digit lakh prices. Bring that figure down to half that, and you’ll see that it’s not such an easy task. Not that auto makers in India fail at this task, but just that the competition this down the order is far more cut throat and to stand out against the established competition is a fairly monumental task. Honda managed to burn, or let’s say slightly singe its fingers with the Jazz – a car which proved that you can have one of the best products in this hotly contested segment, and yet fail to make waves if the pricing is not right. Honda did correct this factor eventually, with a significantly revised pricing for this wonderfully equipped and rather generously sized hatch, and boy did that do wonders for its sales. So with that lesson firmly in mind, Honda wasn’t about to put out a repeat performance when coming up with an entry level hatchback which would go head to head against established hot sellers such as the Hyundai i10 and the lot. 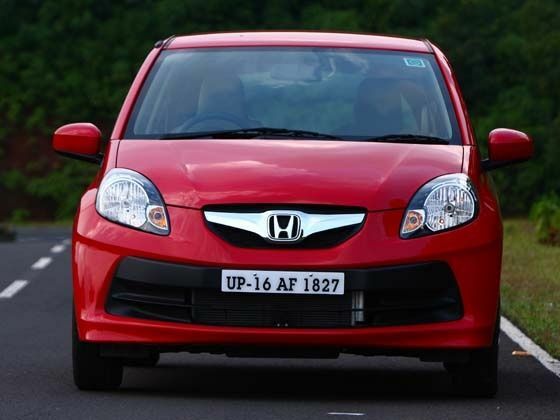 Now Honda does have a lot riding on this little car, given the fact that the entry and mid-order hatchback segments account for most to the top selling cars in India. Also given the fact that Honda has a fairly small product portfolio in India, it becomes even more critical to get each car right. But as we’ve said before, Honda never gets its products wrong, and this fact couldn’t be better iterated after you take a look at the new Brio. The Brio certainly is a looker. In this segment where classical designs are more appreciated than anything radical, the Brio has everything working in its favour. While it doesn’t have the sharp, funky lines of its rival, the Chevrolet Beat, or the radical futuristic styling of its elder sibling, the Jazz, it still manages to stand out in a crowd quite easily. The well proportioned stance with short overhangs is something that really gives the car a dynamic look. While Honda’s designers might want to describe the styling as 'double triangle' or the like in the language only automobile designers can speak and very few apart from their ilk can understand, what is clear to understand is that the Brio does look like it’s moving forward at a good clip even when its standing still, especially when viewed bang-on from the side. This is accentuated by the slashed crease just below the shoulder line and a parallel crease near the bottom of the car. Then there is there is a wide stance with its flared wheel arches, reminiscent of more sporty cars which really improves the appeal by leaps and bounds. This wider track combined with the car's relatively short wheelbase of 2,345mm as well as the lack of overhangs at either end, and the Brio comes across as a little rally car that would be more at home spewing dust on special stages rather than pootling about town. The front of the car bears the typical Honda traits that we’ve come to accept now, such as the large ‘H’ badge on the grille. Then there is the rear of the car. Now most people, especially after looking at the pictures, might say that the all-glass tailgate with the small, sharp clear glass taillights, looks strange. One might even be forgiven for thinking this, as pictures really don’t do it justice. But one look at that rump in the flesh is enough to convince you of how wrong you were. The thick black accents on the glass tail-gate combined with the round lights inside the clear-glass taillight cluster give it the look of a cartoon character from traditional Japanese anime. It makes the car look especially cute and endearing when looked at from the rear angle, and it is probably the most instantly recognisable backside on any Indian hatchback at the moment. The Brio does feel like a small car from the outside, thanks to its proportions. But get inside and it’s another story. What Honda has pulled off is a masterstroke of packaging that when combined with smart colour schemes and well finished materials, gives the car an especially premium feel, even when you disregard its low price point. The interiors offer plenty of room for a four generously sized adults, with a surprising amount of knee room in the back. Even with our larger sized editorial staff behind the wheel, similarly sized staffers enjoyed 2-3 inches of space between their knees and the back of the front seats. This is also thanks to the well designed front seats of the Brio. Not only are these one-piece units especially thin, freeing up space in the cabin, they also provide all the necessary rigidity and comfort comparable to the much larger seats that we find in Honda’s larger cars. Another really interesting result of the choice of seat design is that they resemble the shape of racing-bucket seats you’ll usually find in sports cars. This makes the interiors rather more attractive than just what the combination of the design, colours and materials offers. A special mention needs to be made about the air conditioning vents in the cabin. The thin chrome surrounds and the high quality feel of their opening and closing action are really a unique thing for this segment of car and really gives you the feeling that you’re getting more than your money’s worth. But of course, if one was to nitpick, and picking nits is something we automobile journalists take a lot of pride in, then we would say that the choice of the brown shade in the side of the dashboard near the driver’s side could have been better, or in fact, it would have been better if Honda would have stuck to a single black shade for the entirety of the dashboard to better complement the otherwise beige interiors. But then it’s not like the interiors look bad from any angle, and most people might even prefer the two-tone black-brown dashboard. This mid-level hatchback segment is one where 1.2-litre petrol motors rule the roost, but companies like Maruti Suzuki, Chevrolet and Ford do play it really smart and offer diesel engines as well. With petrol prices shooting through the roof every day, diesel has become the new mantra for most manufacturers, mostly due to an overwhelming response of buyers to switch their preferences of fuel to the heavier one. Now Honda’s forte really is petrol, and when you look at the company’s international portfolio, it’s clear to see that the diesel engine really is the stepchild of the Honda family. The fact that the company doesn’t have a single diesel offering in India means that Honda only has the option of a petrol motor to address all the concerns of Indian buyers, right from the much desired ‘pick-up’ aspect to the even more decisive ‘mileage’ aspect. Our only real grouse with the performance was that its really peaky nature makes spirited driving going uphill on a twisty mountain road a bit of an effort, where the driver really needs to have the ability to keep the revs high as well as rally-driver reflexes to shift quickly through the gears in order to keep the engine in its powerband. When it comes to the story of kilometres to the litre, as we said before, Honda only had a petrol motor to appease the sensibilities of the mileage conscious buyers who form the majority of the people who shop in this segment. But the company did manage to do a fairly good job in this department. In a heavily congested city like Pune, with the air-conditioning on at all times, the Brio managed to churn out a mileage of 13kmpl while on the (relatively) open highways around town, that figure climbed up to 16.7kmpl. Both these figures are not class leading by any means, but they happily match the segment average and are definitely better than some of its rivals. Where this little Honda really, really impresses is in the ride and handling department. With its absolutely brilliantly damped suspension, driving over bumps, potholes and undulations is something you would barely notice. But the more impressive part is how the Honda boffins have managed to marry this great ride quality with a brilliant handling ability. While the ride is well damped and there is a bit of body roll if you chuck the car into a corner with some vigour, the almost square stance (thanks to its wide track and short wheelbase) combined with its brilliant suspension set-up and its specially stiffened chassis, allow this roll to be kept under control at all times. In fact, you’d have to be really ham-fisted and lead-footed (and slow-witted) to unintentionally break traction while going around corners. What aids this sure-footed chassis is an electrically-assisted steering that offers significantly better feedback than what any of Honda’s cars, or even a lot of its rival’s for that matter, have managed to do so far. So whether you are taking your family on a relaxing drive through the countryside, or enjoying that occasional B-road blast, the Brio does it all with the utmost of ease. Sometimes, when an auto maker known primarily for luxury cars, makes an affordable small car, many questions are raised with regards to cost-cutting measures and the company skimping on basic features to keep the price down. But when it comes to Honda, the opinion on the street is quite the opposite. The faith people have in the Honda brand name and the belief that the company will never stoop to compromising on the essentials are both well deserved. Don’t get us wrong; in order to provide such a premium feeling car at its price point, which ranges from Rs 3.95 lakh to Rs 5.10 lakh, Honda has had to cut out some of the fat. But it hasn’t been in places which really matter. A small example of this is that the inside of the Brio’s hood isn’t painted at all and just has a layer of primer. But this is a part of the car that will almost never be seen by anybody, and the paint quality of the rest of the body is better than top notch. There is no dearth of features either. The Brio comes with a 2-DIN music player with radio, auxiliary and USB inputs, steering mounted controls for the same, a tilt-adjustable steering wheel and even ORVM mounted indicators – a feature mostly just seen in premium sedans. The only features that one may miss are a rear defogger and a rear wiper. But when you consider that all models get power steering and front power windows as standard, and the top end also gets not just the works, but also ABS, EBD (Electronic Brake-force Distribution) and SRS airbags, the Brio really does sound like a sweet deal.